TradingView Blog / Pine Script / Alerts in Pine! We have added the annotation function alertcondition allows you to create custom alert conditions in Pine studies. ‘condition’ is a series of boolean values that is used for alert. Available values: true, false. True means alert condition is met, alert should trigger. False means alert condition is not met, alert should not trigger. It is a required argument. ‘tiile’ is an optional argument that sets the name of the alert condition. ‘message’ is an optional argument that specifies text message to display when the alert fires. The function creates alert condition that is available in Create Alert dialog. Please note, that alertcondition does NOT fire alerts from code automatically, it only gives you opportunity to create a custom condition for Create Alert dialog. Alerts must be still set manually. Also, an alert triggered based on a custom condition you created in Pine code is not displayed on a chart. One script may include more than one alertcondition. 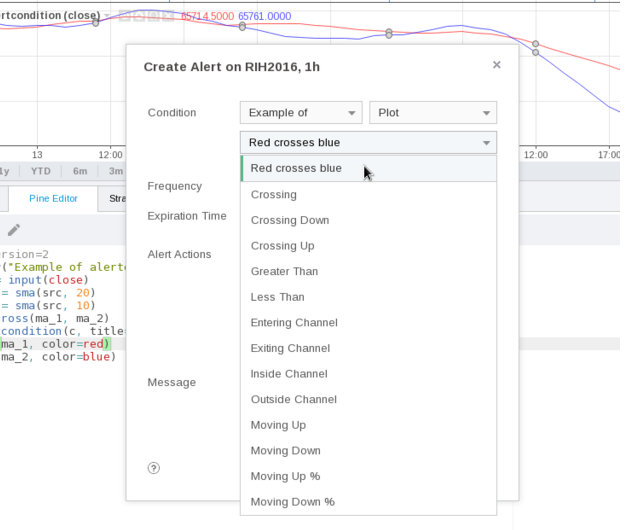 To create an alert based on alertcondition, one should apply a Pine code (study) with alertcontidion to current chart, open the Create Alert dialog, select the applied Pine code as main condition for the alert and choose the specific alert condition (implemented in the code itself).